Based in Wellington, New Zealand, Wellington United AFC boasts one of the finest natural playing surfaces in Wellington known as Newtown Park. The Wellington United Club Rooms have bar and kitchen facilities. Of course, we also have all of the essentials such as 4 changing rooms, showers, referees room and a medical room. 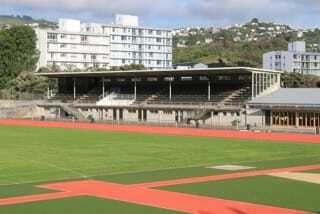 Newtown Park boasts arguably the two best grass playing fields in Wellington. The No. 1 pitch has a sand carpet surface and excellent drainage; the pitch is well able to withstand the rigours of Wellington winters. The No. 1 pitch is also surrounded by the only all-weather running track in the region. The No. 2 pitch was previously the designated training pitch of the Wellington Phoenix. As such the field has been upgraded and its standard has been significantly improved. In 2017 we are excited to be able regain this field for both training and playing purposes. At Wellington United we support and provide Junior, Youth, and Senior, Men and Women's football at all levels (soccer as some countries call it). We have over 600 members with 14 Senior Teams and over 18 Junior teams. To find Newtown Park on a map click here!